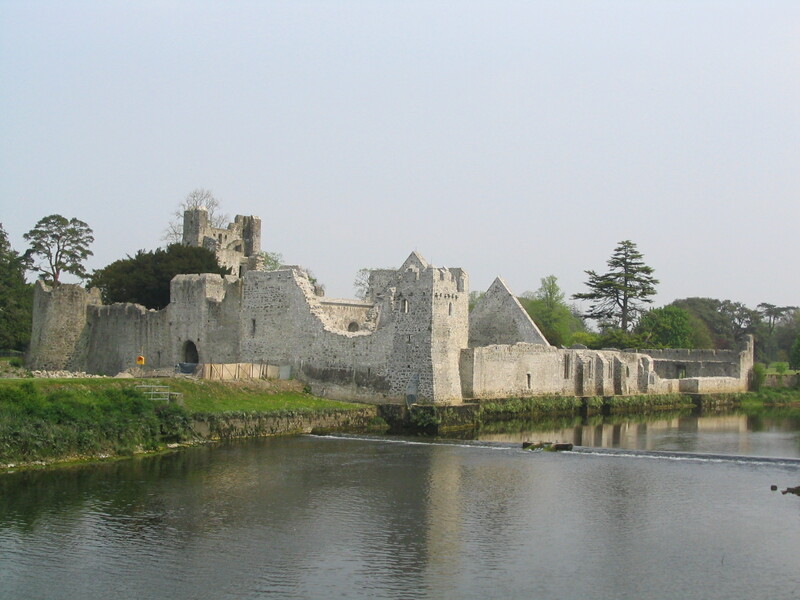 On the road from Limerick to Killarney is Adare (Ath Dara, the ford of the oaks) on the river Maigue. In its well-wooded setting, with medieval church ruins and neat thatched cottages, it is a surprisingly lovely village. Once an O’Donovan stronghold, it was taken by the Anglo-Normans in the reign of Henry II, in 1227 the O’Donovan castle passed into the hands of the Fitzgerald, earl of Kildare, who rebuilt and strengthened it in the following century. Burned by Turlogh O’Brien in the fifteenth century it was again restored, but in 1534 it fell forfeit to the Crown because of Fitzgerald support for the pretender, Perkin Warbeck. The Earl of Desmond kinsman to the Fitzgerald, leased he castle and estates from the Crown, but the Desmonds were, in turn, crushed and their lands confiscated in Elizabethan times. All this territory is studded with the impressive remains, monastic and castellated, of the Desmond family, of whom Macaulay wrote that “they were the greatest and proudest subjects that any Sovereign of Europe ever had.” Gerald, the sixteenth Earl of Desmond, figures largely in the Elizabethan wars as ingens rebellious exemplar. He possessed, says a chronicler, “whole countries, together with the country Palatine of Kerry, and had, of his own name and race, at least 500 gentlemen at his command, all of whom, and his own life also, he lost within the space of three years. His vast estate was a strong inducement to the chief governors of Ireland to make or proclaim him a rebel.” The fortunes of Spenser, Raleigh, Boyle, and a host of English adventurers, were founded of Desmond’s ruin.